This article is about the complete STS project. For the portion which survived to fruition, see Space Shuttle and Space Shuttle program. The Space Transportation System (STS), also known internally to NASA as the Integrated Program Plan (IPP), was a proposed system of reusable manned space vehicles envisioned in 1969 to support extended operations beyond the Apollo program. (NASA appropriated the name for its Space Shuttle Program, the only component of the proposal to survive Congressional funding approval). The purpose of the system was twofold: to reduce the cost of spaceflight by replacing the current method of launching capsules on expendable rockets with reusable spacecraft; and to support ambitious follow-on programs including permanent orbiting space stations around the Earth and Moon, and a human landing mission to Mars. A permanent space station module designed for 6 to 12 occupants, in a 270-nautical-mile (500 km) low Earth orbit, and as a permanent lunar orbit station. Modules could be combined in Earth orbit to create a 50 to 100 person permanent station. A chemically fueled Earth-to-station shuttle. A chemically fueled space tug to move crew and equipment between Earth orbits as high as geosynchronous orbit, which could be adapted as a lunar orbit-to-surface shuttle. A nuclear-powered ferry using the NERVA engine, to move crew, spacecraft and supplies between low Earth orbit and lunar orbit, geosynchronous orbit, or to other planets in the solar system. The tug and ferry vehicles would be of a modular design, allowing them to be clustered and/or staged for large payloads or interplanetary missions. The system would be supported by permanent Earth and lunar orbital propellant depots. The Saturn V might still have been used as a heavy lift launch vehicle for the nuclear ferry and space station modules. A special "Mars Excursion Module" would be the only remaining vehicle necessary for a human Mars landing. As Apollo accomplished its objective of landing the first men on the Moon, political support for further manned space activities began to wane, which was reflected in unwillingness of the Congress to provide funding for most of these extended activities. Based on this, Nixon rejected all parts of the program except the Space Shuttle, which inherited the STS name. As funded, the Shuttle was greatly scaled back from its planned degree of reusability, and deferred in time. The Shuttle first flew in 1981, and was retired in 2011. A second part of the system, Space Station Freedom, was approved in the early 1980s and announced in 1984 by president Ronald Reagan. However, this also became politically unviable by 1993, and was replaced with the International Space Station (ISS), with substantial contribution by Russia. The ISS was completed in 2010. Planned uses for NERVA included a visit to Mars by 1978 and a permanent lunar base by 1981. NERVA rockets would be used for nuclear "tugs" designed to take payloads from Low Earth Orbit to larger orbits, resupply of several space stations in various orbits around the Earth and Moon, and support for a permanent lunar base. The NERVA rocket would also be used in the Saturn S-N, an upper stage for the Saturn V rocket' upgrading the Saturn's low Earth orbit (LEO) capability to 340,000 pounds (150 t). ^ Portree, David S.F. (April 18, 2012). "Integrated Program Plan "Maximum Rate" Traffic Model (1970)". Wired. ^ Space Task Group Report, "Program Objectives", 4.b. ^ a b "Nuclear Rockets: To Mars and Beyond". National Security Science Magazine. Los Alamos National Laboratory. "Report of the Space Task Group, 1969". NASA. Retrieved 6 August 2009. Hepplewhite, T.A. The Space Shuttle Decision: NASA's Search for a Reusable Space Vehicle. Washington, DC: National Aeronautics and Space Administration, 1999. Wade, Mark. 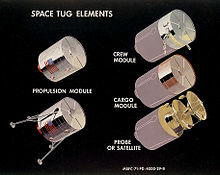 "Space Tug". Encyclopedia Astronautica. Retrieved June 15, 2011. "Beyond Apollo: Five options for NASA's future (1970)". Archived from the original on 8 October 2011.